1Set your camera’s flash setting to No Flash. This figure shows an example of this setting option. 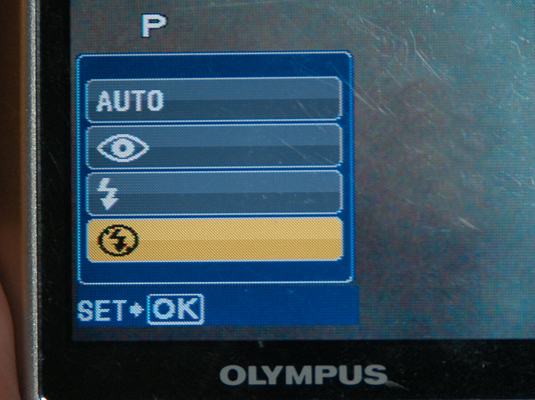 Consult your camera’s manual if you need help figuring out how to make this change on your own camera. 2Make sure you have enough light to take your picture without the flash. Although you may not want to wash out your subject with too much light, you do need to be able to see the subject. 3Take your picture, being sure to keep the camera steady. When you turn off the flash, the camera may reduce the shutter speed to compensate for the dim lighting. If it does, you need to hold the camera steady for a longer period of time to avoid blurry images. Use a tripod or otherwise brace the camera for best results.